There’s a lot to discover in Carnegie Mellon University’s Dietrich College of Humanities and Social Sciences. Each year, instructors are creating new and innovative courses that keep up with current events and look to the future. Here is a sample of the latest cool classes that Dietrich College students are taking. 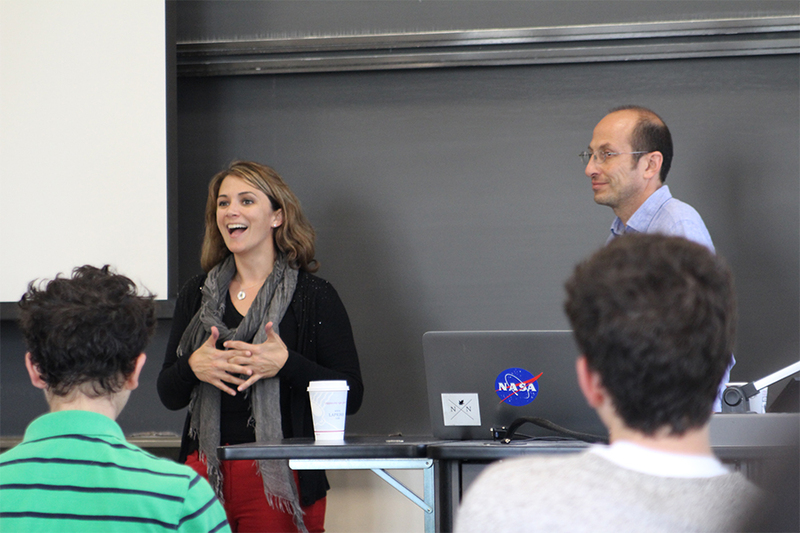 Taught by Jennifer Keating, assistant dean for educational initiative in the Dietrich College, and Illah Nourbakhsh, AI and Humanity is a Grand Challenge Interdisciplinary Freshman Seminar. These courses are designed to create educational experiences that focus on tough societal problems. AI and Humanity embraces the bond between the humanities and computer science by addressing what it means to be human in the context of a rapidly advancing technological age. Ultimately, the goal is to understand the future of human-to-machine relationships. A different point-of-view is why computer science freshman Michael Huang signed up for the course. The variety is also what attracted Rebecca Zheng, a Dietrich College freshman, to sign up for it. Bubbles— such as the market bubble behind the 2008 housing crash, to contemporary information and social bubbles created by social media sites like Facebook—are a basic feature of modern life. To make sense of them, people need to understand basic social science questions about what they believe, where ideas come from and how to measure consequences. Bubbles, taught by Simon DeDeo, requires students to walk in with a willingness and initiative to work with real-world data. The course covers topics ranging from literary fads to revolutions, with examples ranging from the novels of Jane Austen to the algorithms underlying cryptocurrencies such as BitCoin. Another Grand Challenge seminar, this class aims to answer what climate change is, how scientists know it’s happening, why there’s so much public debate over it, what solutions are available and determine the pros and cons of those solutions. Tackling these questions is a three-professor job, with Peter Adams, Kasia Snyder and James Wynn instructing. “I wanted to teach this course because to me proliferating knowledge and understanding, especially amongst young people, of how big and hard won a step forward the global climate agreement—the Paris Agreement—was and what exactly is its nature is the most meaningful follow up a negotiator can pursue outside the UN process,” said Snyder, an adjunct instructor in the Dietrich College. Interested in exploring the challenges and complexities of climate change, CIT freshman Nickia Muraskin has found that the course offers a valuable perspective. Having the opportunity to teach students who are delving into this topic with this interdisciplinary approach is Wynn’s favorite part of the course. Investigating the topic with experts from different backgrounds and angles including, scientific, political, rhetorical, cultural, economic, technological and ethical, Adams is learning alongside the students. A freshman in the Science and Humanities Scholars program, Jacob Feldgoise agrees that the teaching trio makes the course work. "Dietrich College’s new Climate Change course is so fantastic because it’s truly interdisciplinary,” Feldgoise said. “Alongside classmates who show the intellectual diversity of CMU’s student body, I get to learn from professors who specialize in three distinct fields that impact climate change: engineering, rhetoric, and public policy. I applied to CMU hoping to study the interaction between these disciplines, but I never expected to find that intersection within my first year, let alone my first semester." Above: Jennifer Keating and Illah Nourbakhsh teaching Artificial Intelligence and Humanity. 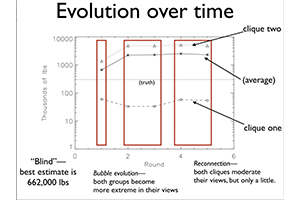 Left: Students in Simon DeDeo’s Bubbles class developed polarized views on the weight of a blue whale, when they’re placed on a network. Image courtesy of DeDeo.